Marvel Hero is a group of the 3 progressive jackpots that can be won by playing 5 various slots at RandomLogic (888) Casinos. All slots have different 9-line or 25-line formats but offer you the same 3 jackpots that are triggered at random. No matching symbols required. The larger your wager is the bigger your chance of hitting a jackpot. Play one of the 4 following Marvel Hero Jackpot games: Spiderman, Fantastic Four, The Incredible Hulk and Thor. Spiderman is a 25 payline video slot with Wild symbol, Scatter symbol and Free Spins bonus features. 3 or more Spider Scatter symbols from left to right trigger the Spider-Man feature. Choose between 15 free spins or the Venom feature. The Spiderweb feature occurs when Spider-Man appears anywhere on reels 2 and 4. After paying winning combinations, all positions on reel 3 become Wild and additional payouts are calculated and awarded. Fantastic Four is a 5 reel, 25-payline slot with Wilds & Scatters and Free Spins bonus. Mr. Fantastic, the Invisible Woman, the Human Torch, The Thing and Dr. Doom appear on reels 1, 2, 3, 4 and 5 respectively and substitute for all other symbols except for Scatter. The bonus feature round is triggered when 3 or more Scatter appear. Select 1 of the 5 free game features to play. Hulk is a 5 reel, 25-payline progressive jackpot slot with Wild & Scatter symbols and Pick a Box bonus feature. The Wild Hulk substitute for all symbols except for Explosion Scatter. 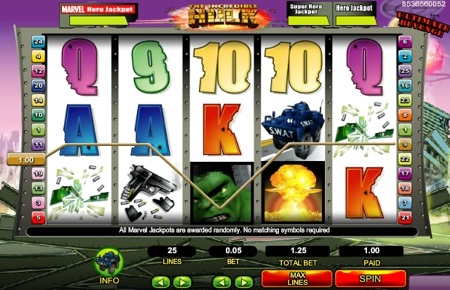 3 or more Explosion Scatter symbols trigger The Hulk bonus game in which prizes are awarded in the form of free spins and multipliers. The prize is doubled (2x) when The Hulk substitutes in a winning combination. Thor is a 5 reel, 9-payline Progressive slot with Wild & Scatter symbols and Free Spins bonus. The Thor symbol is wild and substitutes for all other symbols except for Hammer Scatter. 3 or more Hammer Scatter symbols anywhere on the reels trigger the Free Games - win up to 10 free spins. All prizes during free spins are tripled (3x multiplier). 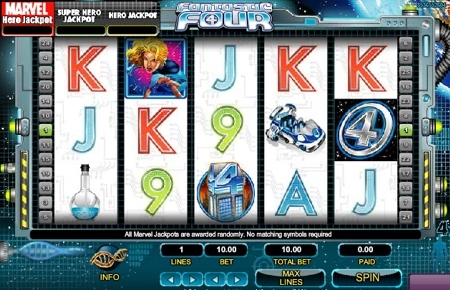 There are 3 jackpots in the games: Marvel Hero Jackpot, Super Hero and Hero. All jackpots grow progressively as bets are made. Each of them can be awarded at random. For each spin, the house adds a small credit to the running jackpots. The larger the bet, the more your chance to win a jackpot. The games look similar to Cryptologic Marvel Hero jackpot slots but offer different jackpots with different average hit values!